Our professional concrete driveway staining in South Orange County can make your driveway a work of art. When someone drives up to your home or business, the driveway is one of the first things they see. A long expanse of plain white concrete can be boring or even an eyesore if it doesn’t complement the overall design of your property.Concrete driveway staining in South Orange County offers almost limitless possibilities for making your driveway serve your architectural design, rather than detracting from it. Beautiful: Concrete driveway staining in South Orange County allows you to achieve color effects that simply aren’t possible with paint. Why? Because stain is translucent, so the color has dimension rather than looking flat. Our water-based stains are available in a wide range of hues, and you can also blend and layer stains, use stencils, or add cut borders to create the exact look you want. Quick: Most of the time, making a dramatic impact on the appearance of your home or business is a major undertaking lasting weeks or months. But concrete driveway staining in South Orange County can be done in a matter of days, giving you almost instant improvement in your curb appeal. Cost-Effective: Concrete driveway staining in South Orange County is a particularly good investment when you’re dealing with an old, discolored driveway. With the right combination of stains, you can cover many types of imperfections at a fraction of the cost of pouring new concrete. You can also create the look of expensive materials like stone or tile without breaking your budget. 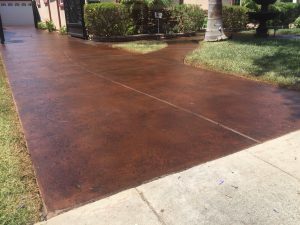 Concrete driveway staining in South Orange County is definitely not a DIY job, as there is a lot of skill involved in prepping the concrete, mixing colors, and applying the stain correctly. Fuller Concrete Staining specializes in transforming driveways with stain, and we’ve mastered all the best techniques for this process. We will work hard to help you realize your design vision, and the quality of our work is always guaranteed.